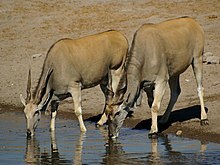 The eland is the largest antelope. There are two species, both African. The common eland, Taurotragus oryx, is from East Africa and South Africa. The giant eland, Taurotragus derbianus, is found in Sudan, Central African Republic, Cameroon and Senegal and West Africa. The two species are rather similar in size: males range in size from 600 and 800 kilograms (1,300 and 1,800 lb) and may even reach a ton on rare occasions; females range from 400 and 600 kilograms (880 and 1,320 lb). Giant eland are alert and wary, making them difficult to approach and observe. They are gregarious, and migrate in small herds of twenty or so animals. Giant eland live in open forest and savannah where they eat grass, leaves, and branches. Common eland live in large herds. Observers have, as usual, found it difficult to measure their speed of running. Some claim they move quickly, running at over 70 kilometres per hour (43 mph), and despite their size are exceptional jumpers, easily clearing heights of 1.5 metres (4 ft 11 in). Others claim elands are one of the slowest antelopes, but can even jump a height of 2.5 metres (8 ft 2 in) or more. When walking, tendon or joints in the eland's foreleg produce a sharp clicking sound, the cause of which is not known. The sound carries some distance and is a good indication of an approaching herd. Naturalists think it is a form of communication in elands. ↑ "General Information". Bio.davidson.edu. Retrieved 2011-01-05. ↑ "Common eland at Arkive". Arkive.org. Retrieved 2011-01-05. ↑ "Common Eland at". Ultimateungulate.com. Retrieved 2011-01-05. ↑ 7.0 7.1 "Animal bytes - Common eland". Seaworld.org. Retrieved 2011-01-05. This page was last changed on 25 April 2015, at 08:57.